There is a ray of hope for chess after hundreds of players took part in an inaugural Kiambu Chess tournament at the weekend which shattered a long-standing record for number of participants in recent times. Organizers of Kiambu Open managed to bring together more than 346 registered participants for the two-day event. This was much more than the attendance for local chess tournaments which averaged 60-100 participants. Well attended tournaments had 200. In Kiambu, there were three categories namely Kiambu Open Challengers, FIDE-rated Open and Juniors. The six round Swiss System tournament was played with rapid time control of ninety minutes per player to finish a game. The tournament was organized by the Nairobi Chess Academy and sponsored by Kiambu County Government. Purity Gachigi, a decorated international chess player observed: “Long time ago before I started playing chess in the early 90's, there were huge tournaments in big hotels like The Stanley and 680 that had up to 500 participants. These numbers have taken a downhill with time. Ugandan Ivy Amoko won the FIDE-rated category for women with five points pocketing cash prize of Sh.30,000 while Purity Maina finished second on 4.5 points and went home with Sh.20,000. Rose Wabuti wrapped up the podium finish with 4.5 points and was awarded Sh.5,000. 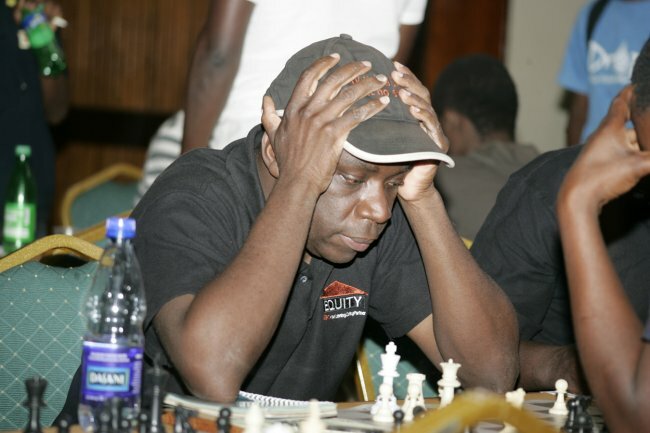 In the FIDE-rated open category, Joseph Muragu Methu was the winner taking home Sh. 20,000 beating Ben Magana and Peter Gilruth to second and third places respectively in tiebreak. They all tied at 5.5 points. Kenneth Kimani Mukii was crowned the winner in Challengers' Category open section with a Sh.30,000 cash prize while Maryanne Gachema won the women's section with a cash prize of Sh.30,000. Meanwhile, Nakumatt Stores have partnered with Chess Kenya to organize chess clinics across 25 of their major branches in the country. The partnership will start with a pilot clinic at their Nakumatt Mega branch in Nairobi on April 11. They are targeting to register over 200 juniors for the day-long event. “These clinics will be open to juniors between the ages of 6 to 10 under the banner "Grooming Young Minds". Depending on the outcome of this pilot clinic, Nakumatt will roll out the same across 25 of the major branches across Kenya,” reads a statement from Chess Kenya (CK). The federation will provide boards and volunteer trainers while Nakumatt will provide space and marketing material. These clinics are scheduled to be held once every weekend across all their 25 major branches with an average of 200 kids enrolling. The partnership has been championed by CK CEO Satish Deshpande. At the same time, CK has announced criteria for selecting Kenya’s representatives at the Africa Zonal 4.2 Championship. Rankings as per NCA Open Tournament held at Makini School last month, citizenship, FIDE rating and ability to self-sponsor will all be considered. Kenya’s slots have been increased to 5 for open and 5 for ladies categories. All players have been given a one week deadline to show willingness of participation.